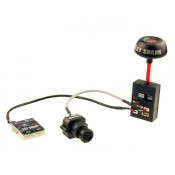 FPV or "First Person Video" or "First Person View" depending on who you talk to or what website you are reading is when you see video from your plane or drone/quad in real time letting you fly the plane like you are in the plane making for a very immersive experience. When flying FPV the radio transmitter in your hand controls the throttle and servos in your plane. In your plane there is a video/audio transmitter that is transmitting video and sound back to your goggles or a video screen so you have signals going both directions. There is a battery that plugs into the goggles to power the receiver and screen in your goggles. The video transmitter in the plane is powered by your flight battery for its power. There is not usually an additional battery in the plane. FPV racing is an exciting new sport that combines high-tech quadcopters and high-speed racing, using for example the E-max nighthawk. 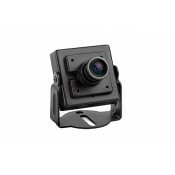 1/3-Inch CMOS FPV Video Camera (PAL)Super light FPV Camera in PAL format 720hx576vSize32x32x45mmReso..
800 TVL High Resolution HD FPV Various Focus Board CameraSize 35x35x45mmResolution ..
Emax Pagoda 2 Antenna RHCP SMA x 2 Version 80mmSPECIFICATIONS Center frequen..
Mi600s 5.8GHz 32ch 600mw Compact Video Transmitter1.Small and light easy to mount with minimal f..
SONY 811 700TVL 1/3-Inch CCD Video Camera Metal Case (PAL) with power input lead 2/3s and video outp..